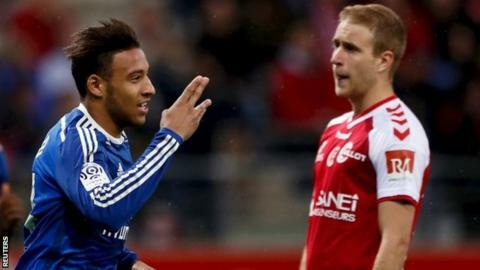 Lyon moved back to the top of the Ligue 1 table on goal difference from Paris St-Germain with a win over Reims. They led 2-0 within six minutes through Corentin Tolisso's header and Alexandre Lacazette's strike at the far post. Alexi Peuget's shot was deflected in via Lyon's Maxime Gonalons for an own goal but Clinton N'Jie made it 3-1. There were two goals by Reims players in injury time as Mickael Tacalfred's own goal was followed by Gaetan Charbonnier's header. Champions Paris St-Germain can go back to the top on Tuesday when they play Metz in their game in hand (20:00 BST). Earlier on Sunday, Monaco boosted their hopes of qualifying for next season's Champions League as they beat Lens 3-0. This season's quarter-finalists are two points above St Etienne, who moved up to fourth with a 1-0 win over Montpellier.